Folks, I’m really and truly happy to announce I’ve finished the expansion of the old cartomancy guide and it is officially released for your purchase and perusal! So begins a nineteenth century Italian charm making use of a small deck of playing cards. This brief-but-richly drawn book explores the practice of divination by playing cards—known as cartomancy. It reveals the “secrets in plain sight” which hide within the pips, kings, queens, and jokers of a standard deck. Explore one method of divination in-depth as you meet the “fifty-four devils”—the symbolic spirits of each card—and learn about invoking ancestral blessings for card readings, the folklore of playing cards, and how to relate fairy tales to a spread along the way. Two of my favorite new elements—and I am obviously a bit biased—are the section about how to relate fairy and folk tales to card readings to enhance divination and the 20-page appendix which contains a wide variety of folklore on card reading (including short commentaries and even a little historical fiction by yours truly). I also really love the cover, which was designed by my lovely wife! If you’re a fan of cartomancy or divination, I think you’ll like this book. And if you’re a fan of this show/site, I think the same will be true for you. This also gives you an opportunity to support the show as well, and at $6 or less a pop, you can’t go wrong, right? 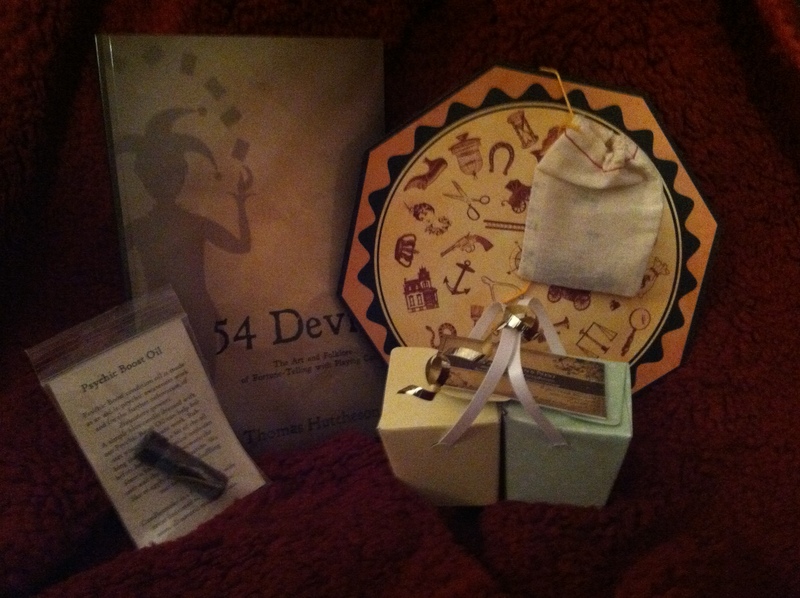 On a related note, the sidebar of the blog/website now contains a button showing the cover of Fifty-Four Devils which will take you to our digital Book Shop, where you can currently find all the purchase information on this book. Over time I’ll be adding other books there as well. Hopefully some will be more of my own books, but I’ll also link to works I cite frequently and to books by authors who have appeared on the show or contributed to the blog. Any purchase you make helps us out just a little bit, so it’s a great way to support us while getting great books! I’m very happy to be able to share this book with you all! Please let me know what you think of it, and happy reading!